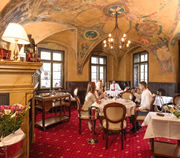 Elegant Café Mozart is set in a prime location overlooking the Old Town Square. During the day, enjoy coffee and cake here. In the evening, Café Mozart hosts 'Dinner & Mozart' and 'Dinner & Jazz' nights, which combine a delicious meal with a live concert. 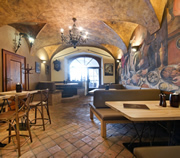 The Medieval Tavern is a historic restaurant in the Old Town. 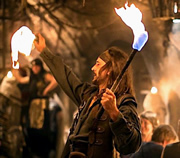 It lays on the finest medieval feast in Prague with entertainment, hearty food and drinks included. Swordsmen, jugglers, dancers and musicians perform. Duration: 2½-3 hours. Operates all year. An all-inclusive evening of warm local hospitality and entertainment featuring Czech folk music, song and dance. Includes a hotel pick up, 4 course dinner, and unlimited beer, wine and soft drinks. Duration: 3 hours. Operates all year. For a few hours, experience the classic old world charm Prague is famed for. U Maliru was established in 1543 and has the feel of the special occasion about it. The dining room is beautiful and atmospheric; the vaulted ceilings are painted with magnificent frescos, and the tables finely dressed. Triton in Wenceslas Square is the première Art Nouveau restaurant in Prague. Its unique interior is designed to resemble a stalactite cave. Triton opened in 1912, it is ideal for a romantic meal or for groups looking to spend a pleasant, relaxed evening in the company of friends or family. Bily Konicek is located in the 12th century medieval cellars of one of the oldest houses on the Old Town Square. The restaurant has modern furnishings, with an emphasis on glass and dark woods; creatively blended into alcoves and open spaces. 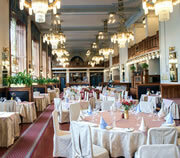 Bily Konicek is for all occasions, from romantic meals to large parties. Live bands play Latin to Jazz & Blues music. Set on the hillside just below Prague Castle, Piano Nobile at Villa Richter offers the finest Czech cuisine dining experience in the city. Amongst the vines and garden terraces of one of Bohemia's oldest vineyards, enjoy the delightful setting and the magnificent panoramic views over Prague. 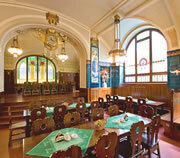 Plzenska is situated inside one of Europe's finest Art Nouveau buildings, the stunning Municipal House. Named after the Czech beer, Pilsner Urquell, the restaurant presents classic Czech cuisine in a typical beer hall atmosphere, with a style perhaps unrivalled in Prague. Its interior has magnificent Art Nouveau features. Live accordionist / duo play every night. 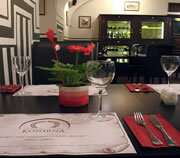 Konirna is a mix of modern and traditional Czech, in cuisine and appearance. 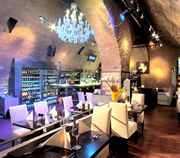 The restaurant is set on a charming small square in the Lesser Town area of Prague, near Charles Bridge. This tranquil location has a real old world atmosphere. Good, reasonably priced food served by friendly staff. 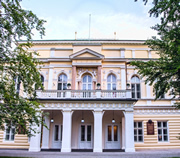 Zofin Palace is a beautiful neo-Renaissance building on Slavonic Island, near the National Theatre. This idyllic spot, surrounded by nature, has views over the river. 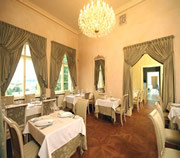 Zofin offers informal dining in an elegant setting. Service is good and the food reasonably priced. A nice restaurant for groups, couples and families. 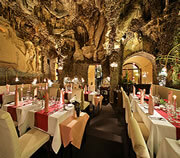 U Mecenase is a traditional Czech restaurant with plenty of ambience, serving good food at reasonable prices. 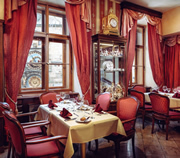 One of the oldest restaurants in Prague, it has been beautifully refurbished to offer a taste of olden day Prague in a comfortable 21st century manner. U Vejvodu is a historic pub, beer hall and restaurant all rolled into one. 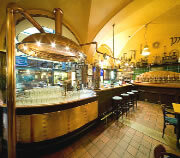 Along with hearty Czech pub food, U Vejvodu serves some of the freshest Pilsner Urquell beer in Prague. Prague stag nights, hen parties, couples and birthday parties mix in a vibrant atmosphere. Live accordion most nights. 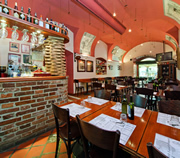 Corto is a family run pizza and pasta restaurant located between Wenceslas Square and the Old Town Square, just two minutes walk from either. It is the oldest Italian restaurant in the city centre, and is set in a charming 14th century building. Corto is suitable for couples, groups of friends and families, hen nights, stag parties and student groups.